I was messing around with some python script to test a spamassassin install. It checks al the mail in the spam folder an see if it is marked as spam. Then it goes through the mail in ham/ and see if it passes as not-spam. So I’m developing it on my local computer but I wanted to test it on a remote server. Well, actually not that remote because I can touch it from where I’m sitting but that’s not the point :) The point was that I needed something to keep the remote version of the sourcecode in sync with the local source. Google to the rescue and I found lsyncd. 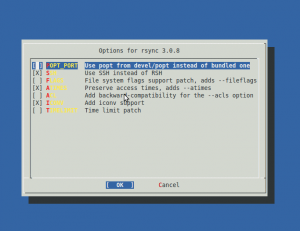 A nice little tool to sync two directories with rsync. Too bad it didn’t support transfers only via sftp because freebsd (the remote server) doesn’t come with rsync installed. So I had to install that also :( Yeah, tough job…. After this was done I could go on developing.